My two favorite songs have been for years Somewhere over the rainbow and L Armstrong’s What a wonderful World. Thank you IZ for putting them together! I’ll be joining you soon. for me is one of the best songs……. Thanks for the song,thanks for the music,i hope and pray one day we will meet up in Heaven,i’m only just now finding out about your music,and sadden by the fact your gone so long already,be blessed those you have left behind God Bless you all………..
My daddy told me about IZ, and him singing “over the rainbow” he said it brought tears to his eyes. I found the web page he gave me and I too listened to IZ sing this song and more….brought tears to my eyes as well. How gifted, to touch the human mind and spirit, in such a busy, turmoiled world to find peace in such a voice. Just wana send our best warmest greetings and thought from Sweden here in Europe and in remembrance memory of this wounderful guy with such a big heart, Israel “IZ” Kamakaiwo`Ole and to all “IZ-Fans” around the globe! Israel “IZ” Kamakaiwo`Ole will always have a special place in our hearts! I want to say this song always give me a good feeling. I have lost so many family members over the years that evertime i hear this song I know where to go look for them. My gramma still sings this song to us. I know the day I die ( and I think it is soon) I want them to play this song for me at my funeral. I have already wrote what I want at my funeral in my will. Peace out. Our prayers and love to IZ’s family. IZ is will always be remembered. He is blessed for his songs. He has feelings for the way he sings & plays his ukalei and it is beautiful. God bless and Aloha! The Love of my Life passed away this year in June. We spent 5 years together. The last year, he often wasn’t himself. Whenever we’d hear IZ , we’d dance our “Lil dance of gratefulness & goofiness”… for we had each other. You were blessed because someone who can give us such wonderful song, he has been blessed. Continue with this lovely song. Thank you a lot. for his family and friends loss, and us all!!!! WOW! i wish i had discovered IZ sooner when he was alive! my friend turned me on to IZ and SOMEWHERE OVER THE RAINBOW. 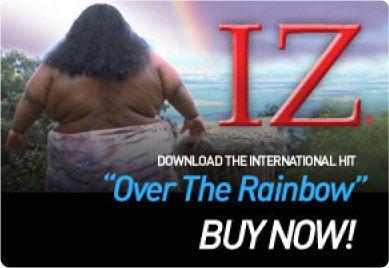 NO ONE will ever sing Over The Rainbow like IZ did! His version of the song is magic and when I hear it, I am transported to a place I only wish I could stay! This is a beautiful site and you have given his fans a wonderful gift! What a beautiful soul IZ is……… and what a beautiful man he was. Thanks, ’cause while I listen your music, I feel my <3 grandmother near me, I can feel her caress. A wanna give you a big BIG HUG 🙂 thank u! I love this song and his version is the best. It makes you think of long ago and far away places and people that have been part of our lives. Blessed be Iz. You will be missed. First heard IZ sing on Coast to Coast. Thank you for giving me the blessing of seeing the video. What an insightful version of this beautiful song, IZ really added feeling to make it more meaningful for all of our lives. It’s nice to see he is just over the rainbow as well. I love this version of Over The Rainbow. Listen to it everyday. So sorry for his passing. He will be greatly missed. God Bless You IZ.